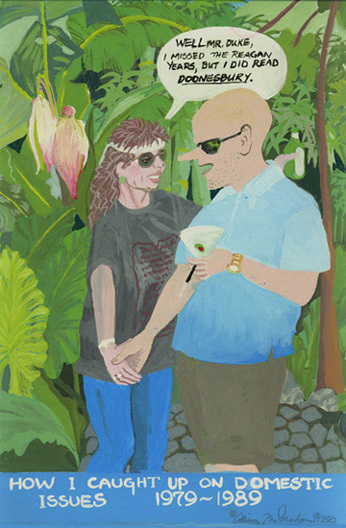 The piece above is a gouache painting done after my return to the United States after ten years abroad, during which "I missed the Reagan years," but Uncle Duke (above) kept me informed. I was struck by the opacity of the sand colors here, as I had been struck by the luminous variety of greens for which my palette had been unprepared when I first went to Taiwan. 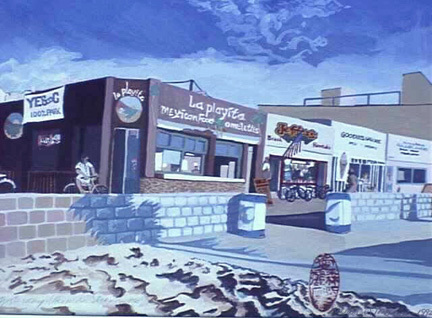 This was a favorite restaurant on the Strand in Hermosa Beach. It has been torn down in the last five years. The banner on the left of the building advises voting on one of the many propositions that passed before the voters regarding the dispensation of the property. These buildings had stood next to the old Biltmore Hotel all through my childhood and remained the same beachfront shops they had always been until just recently. This is one of the "Holes in Reality" series (archive 2)I've worked on since my return. In this one, the sand and sky take on a more abstract and unreal quality than the man-made structures, and the chop I sign with, while floating on top, is at the same time also a hole in the unreal reality--the holes that the Taoist fellow and the Buddhist monk (Archive 2) pass through from world to world in Chinese literature. The piece above is a watercolor painting done after my return to the United States after ten years abroad. 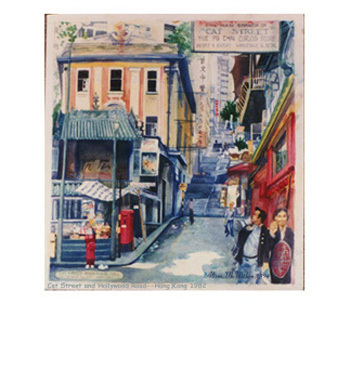 I began this one, "Cat Street and Hollywood Road," in 1989, while I was living in Taipei, but didn't finish it until 1994, twelve years after I had taken the original photos. The challenge I offered myself in this one was to arrange all the buildings in the proper perspective, as well as the steep stairs of this "ladder street," without sketching any of it in pencil--a challenge I'd offered myself since 1982 when I first began working with no preliminary pencil underdrawing. I found that the tentative yellow underpainting, moving as it does from place to place before finally settling in to its final position, makes the paintings more alive. This is another one of the "Holes in Reality" series (Archive 2) I've worked on since my return. In this one, as in "Hermosa Beach Strand," the chop I sign with, while floating on top, is at the same time also a hole in the reality--the holes that the Taoist fellow and the Buddhist monk (Archive 2) pass through from world to world in Chinese literature. We also visited the site of this temple, Man Mo temple, in March 1997, and took pictures. The stairs were torn up and the temple painted and cleaned, and the vendors' booths lining the stairs were all gone. It was impossible to get the same camera angle of fifteen years ago due to the presence of numerous poles at the top of the stairs where we stood. We did, however, manage to take several photos and I stripped them together with Adobe Photoshop, making an approximation of the scene for comparison. I used another photograph, taken from approximately the same position as the photo used for this painting was taken, to practice a new skill: erasing objects, i.e. the many poles that are now between the camera and the scene. Click here to view photos of our trip to "Sunset on the Empire" last March. There, you'll see another stripped together photo: one of us together reading a Hermosa newspaper, made from separate images of each other in the same place. No one does it better than the Iraqi Information Minister. Footnotes to the McArchives: Paintings of the other world: "Holes in Reality"
Link for how to write colors. It's an incredible html color site.